As readers of this blog know, I’ve always been partial to mid-century modern. OK – let’s be truthful – I adore it! The design inspired some of our best-loved architects including Frank Lloyd Wright, Charles Gwathmey, Ludwig Miles van der Rohe, Eero Saarinen and other icons, many of whom were awed by the approach of Bauhaus artists and architects. Many such homes are living sculptures. Their elegant geometry sets them apart, and they are often one-of-a-kind masterpieces that blend beautifully with their surrounding environments. Mid-century modern, popularized from the 1930s to the 1960s, didn’t just survive the decades to remain sought-after today, but it also produced homes that literally shaped the future of architectural home design. That’s one reason they never go out of style. 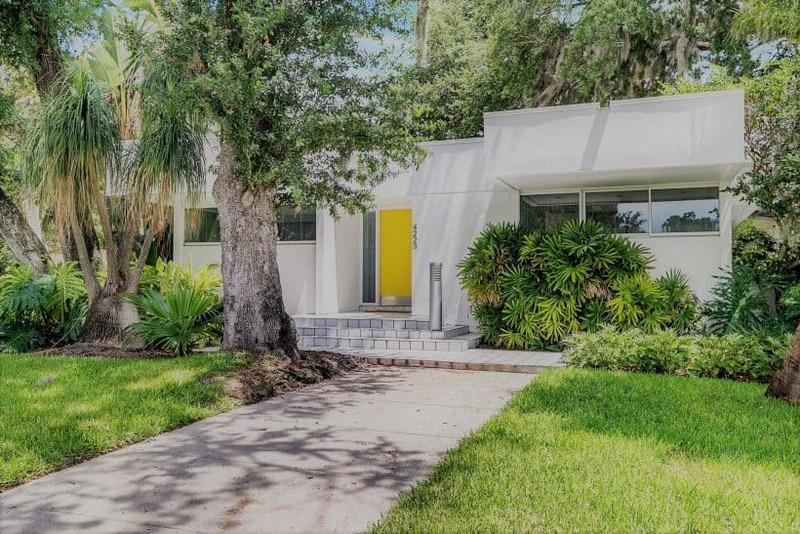 Given my passion for mid-century modern, I’m always ecstatic when that rare Beach Park, Tampa property falls into my hands for representation as a Realtor. I’m inevitably torn because I’m dead-sure a buyer will materialize to appreciate the home as much as I do, but a part of me is driven to snap up the home myself! I’m holding myself back from this one as, sadly, the timing just isn’t right for me. You’ll see why I’m tempted – read on! 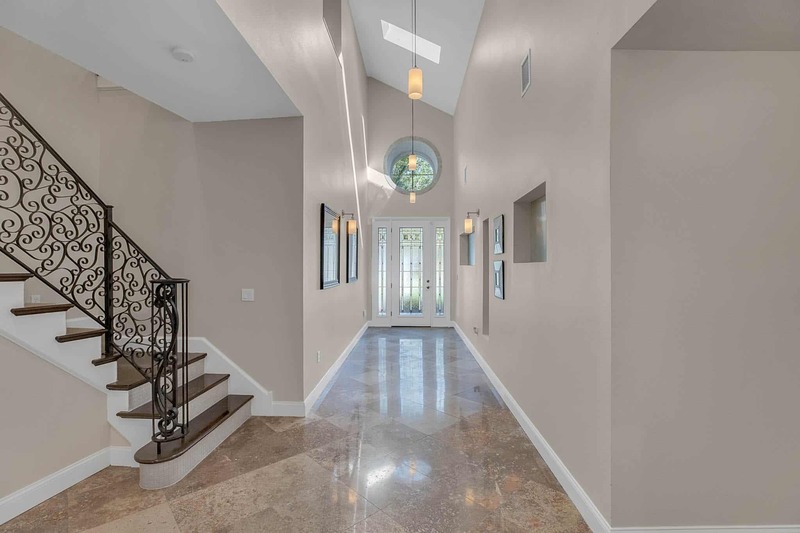 Priced at $535,000 and situated in the premier South Tampa area near Plant High School, this home is destined to move fast! 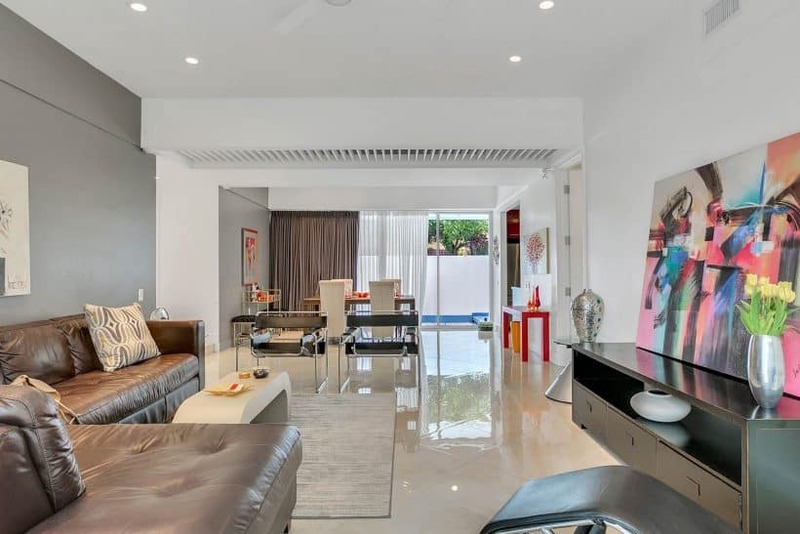 Built in 1986, beyond the traditional time period for mid-century modern architecture, this home nevertheless is possessed of all the attributes. Let’s start with curb-appeal – always a good place to begin! You can see from the street that the design is clean and minimalist, with an angular structure, symmetrical banks of windows and three steps to the front door. The first impression is one of supreme elegance. There’s an attached garage, but it’s side-entry on a corner lot, so takes nothing away from the front of the home. The flat planes and symmetry of design are evident from every side of this solid block, sophisticated white house, including the tiled patio. The lot features equally elegant landscaping to match. Indoors at 4223 Cleveland, you’ll see the typical mid-century modern use of materials with generous use of porcelain flooring. Banks of glassed doors in clean white frames not only give generous views but also make it easy and tempting to step outdoors to linger over a cup of tea. 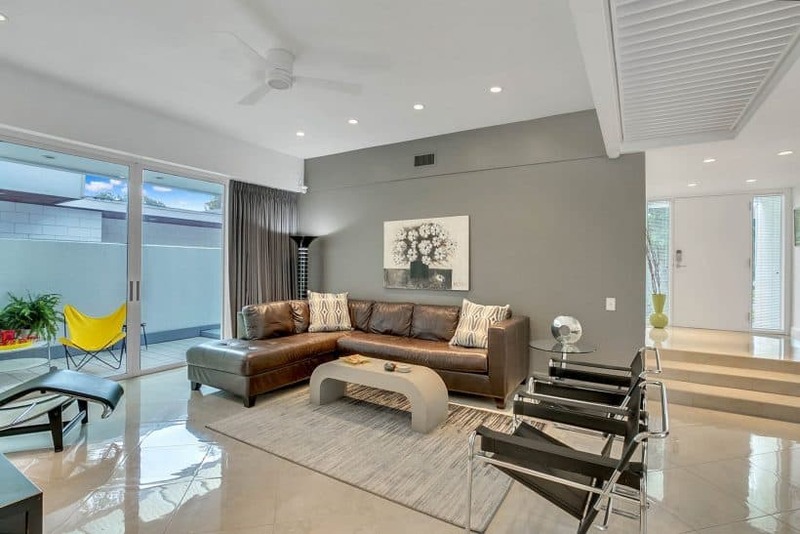 A three-bedroom, two-bath home, the structure is 1,466 square feet with a spacious feel and updated bathrooms plus a new roof – with the renovation overseen by the owners, one of whom is an interior designer! Speaking of designers, the architect is Rick Rados, who studied painting under Hiram Williams as well as earning his architectural degree from the University of Florida. He’s received dozens of awards for design excellence and been featured in periodicals, journals and books. 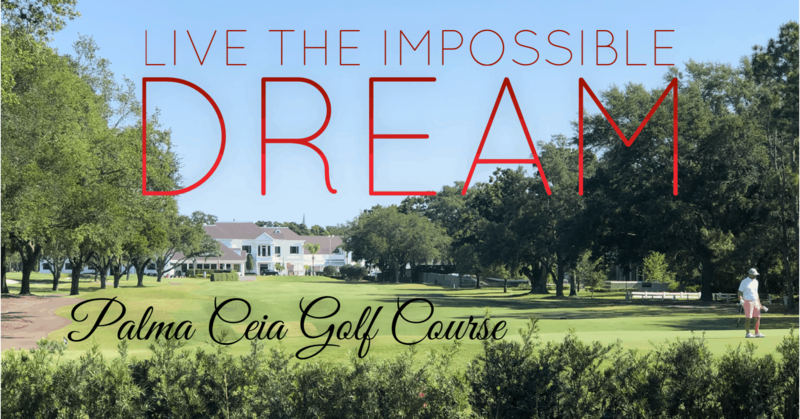 In 2003 he won the Medal of Honor from the Tampa Bay area chapter of the American Institute of Architects. He’s taught architectural design at the university level. And, as an interesting footnote, he designed the house next door to this one, which he lived in before moving to 4223 Cleveland. Glam Extras to Brag About! 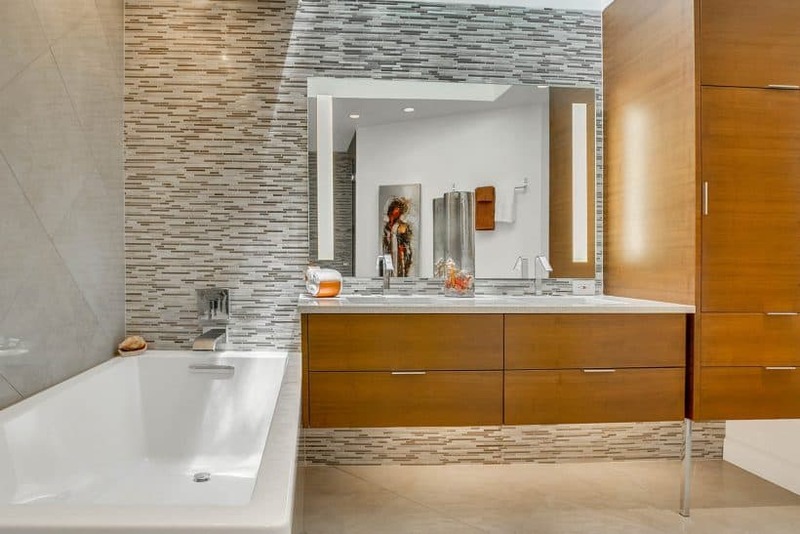 Here’s more to consider: There are hurricane-impact skylights in both bathrooms and modern custom floating bathroom cabinetry by Hafele. The master bath has dual sinks, dual shower heads and a soaking tub. 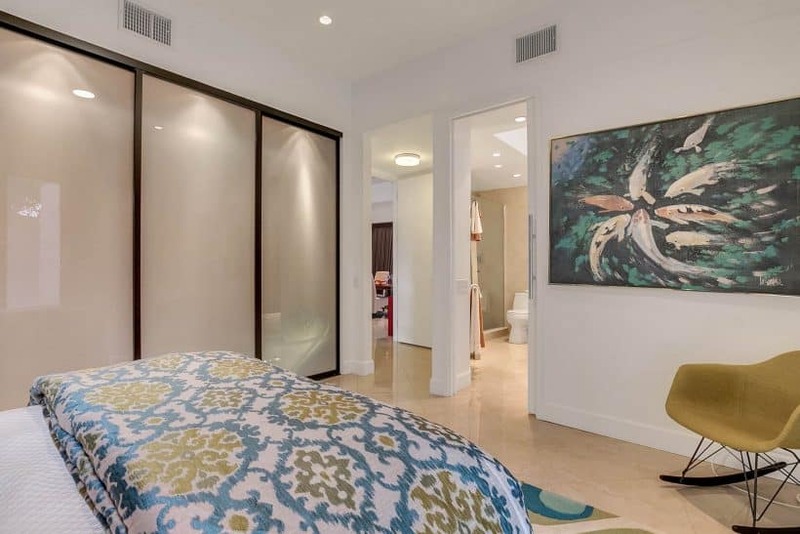 Glam lighted mirrors complete the look. The kitchen features a Bosch dishwasher and Jennair refrigerator. Appliances are stainless steel, with granite counters in kitchen and baths. Floor to ceiling sliders on both sides of the home open onto two patios, providing that indoor-outdoor feel. The house is prewired for surround-sound in the living room. With your smartphone app, you can turn on and off the remote-controlled sprinkler system. Reclaimed water is employed with a flat fee for watering the lot’s lush lawn. The security is “smart,” too, with integrated door locks controlled by one panel and smartphone. There are three interior cameras, and a whole house alarm connects every door and window. The Nest thermostat is new, and the AC is new as of 2012. The roof, replaced in 2013, carries a 20-year manufacturer’s warranty. You can view the video for this spectacular home here. Never been to one of the Frank Lloyd Wright homes or any other mid-century modern once-private home now open to the public? Don’t assume you haven’t seen and appreciated the style. You may have already admired these architects’ handiwork. Saarinen, whom I mentioned above, designed the Washington Dulles International Airport, the TWA Flight Center in New York City and the Gateway Arch in St. Louis, Missouri. Mid-century modern design is “characterized by a contemporary, seemingly futuristic aesthetic and an emphasis on function,” Kelly Richman-Abdou writes on MyModernMet.com. The architects, just like the mid-century artists, reimagined traditional art and pioneered that new aesthetic, which in the case of many such homes features flat planes and little ornamentation, often played out in monochromatic brickwork. Many mid-century builders and architects eschewed the traditional methods that employed bulky support walls, instead embracing the then-groundbreaking post-and-beam design that allowed for the massive expanses of glass that enable homeowners to gaze on green leafiness whenever they happen to glance outdoors. 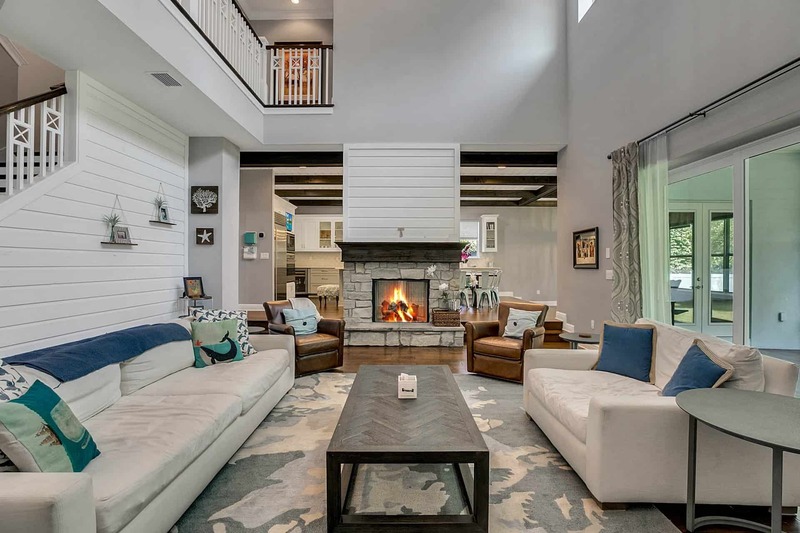 This home in Tampa is one of those gems! If you’re as enthralled with this home as I am, and you’re looking to relocate, size down or size up – give me a call. Update to this post: This home is currently sold, but we have others. If you are a buyer or a seller looking to sell a mid-century home in Tampa Bay, please send me a message here. This fabulous home sold for 25K over appraised value! I’ve always loved the clean lines, angled roof lines and artful indoor-outdoor marriage of the mid–century modern style of architecture. Two reasons: It’s a classic mid–century modern, a personal style favorite of mine, and it’s also a house with a pedigree. Rae is a consummate professional and knows the industry inside and out. She's always working with creative marketing ideas and bringing results and feedback.